Pictured (l to r) are Alison Simpson, Fraserburgh 2021; Fraserburgh SNP councillor Brian Topping; Stewart Stevenson MSP; Alastair Rhind, Aberdeenshire Council. 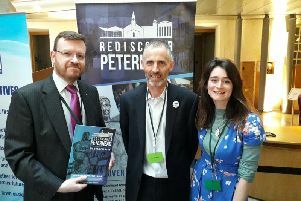 Scotland’s Towns Partnership (STP) held an event in Parliament last week to showcase local regeneration projects and Fraserburgh was among the towns represented. Banffshire & Buchan Coast MSP Stewart Stevenson was pleased to meet with officials from Fraserburgh 2021 to be briefed on progress. He said: “It was a pleasure to meet with representatives from Fraserburgh 2021 and hear an update on their plans. Ms Campbell said: “Communities across Scotland are doing fantastic work in our towns. Whether it’s residents, businesses or local groups, it is communities who hold the knowledge and understanding of how their towns work and who have a long-term vested interest in getting things right. “Their dedication, ambition and hard work has led to significant improvements in many of our towns. We continue to invest in community empowerment through a wide range of funds which support the regeneration of our towns.